I'm Supriya Kutty, writer, cook, daydreamer, mom to a teen and wife to a military man. My blog www.quichentell.com has food at its soul, served with liberal helpings of ramblings from a life, lived in many cities and a few countries. Food is powerful. It arouses emotions, creates memories, and connects cultures, peoples and civilizations. It is linked to nature, to the seasons and to life itself at the umbilicus. In my blog I try to explore this intuitive and organic relationship through the the food that I eat and cook. Beyond the recipes and techniques I want everyone who reads it to taste, touch and feel the food and the ways in which it moves in me. Delicate, subtle and melt-in-the-mouth, shami kebabs are a universal favourite. 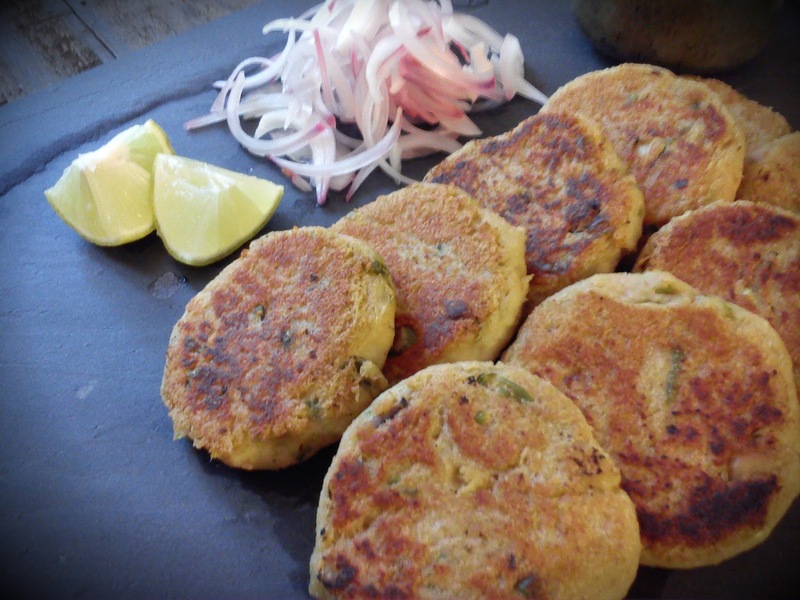 Whether you decide to eat them with naan, the traditional way or as finger food with drinks, shami kebabs are so delicious that they disappear before you can say ‘kebab’. Having originated in the kitchens of Mughal emperors and perfected by the nawabs of Awadh, it is no surprise that these are mutton (tender goat meat) kebabs, the preferred meat of royal kitchens. Lightly spiced with whole spices, these velvet-textured discs highlight the typical flavour of mutton. But if you want somewhat lighter kebabs that are equally yummy, chicken can be a good substitute, if you use chicken thighs - since they are fattier and hence more flavourful than breasts. Chicken thigh meat yields softer and more succulent kebabs. 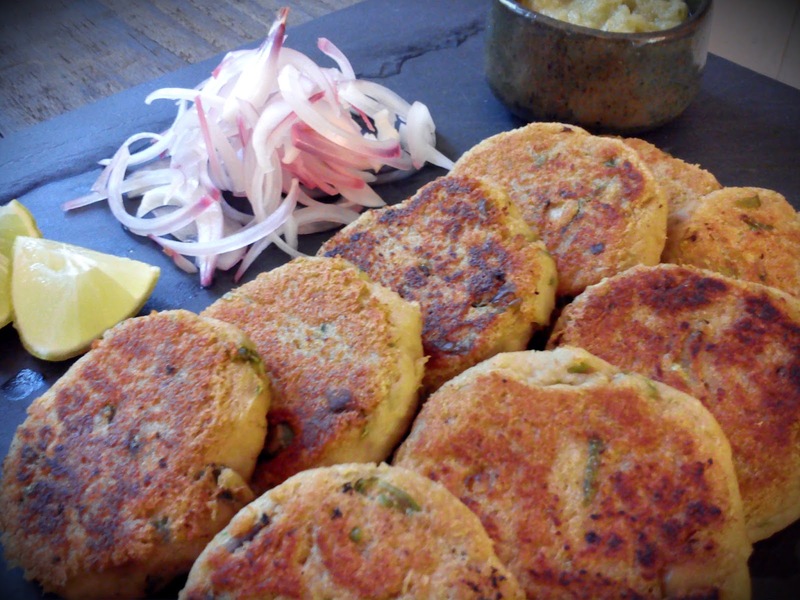 Requiring normal store cupboard ingredients, these shami kebabs are easy and can be made a day earlier and fried just before serving. They are best paired with thinly sliced onions and mint chutney. Wash and drain both the dals. Place the chicken, dals, garlic, ginger and all the dry spices in a shallow bowl that can fit into the pressure cooker. Pour in 100 ml water and pressure cook for 15 minutes (3-4 whistles). Once the cooker has cooled, remove the bowl and drain all the water from the pan (you can reserve this fragrant stock to flavour dals or curries), remove all the spices except the ginger and garlic and allow the chicken and dals to cool. Transfer the cooled chicken and dals to a grinder and grind to a fine paste without using any water. You will have to scrape down the mixture one or two times to get a smooth paste. Spoon this mixture into a clean bowl, add the chopped chillies, coriander and salt and mix till well combined. You now have a soft, fragrant kebab mixture. Lightly oil your palms, roll lemon-sized balls with the paste and flatten to make small discs (not too thin). Place these on a wide plate and chill uncovered in the fridge for a couple of hours or covered overnight ( or else they will turn very dry). Heat 3-4 tbsps oil on a flat pan or griddle (tawa) till hot and cook the kebabs till golden on each side (3-4 minutes on each side), adding a few drops of oil as needed (do not deep fry). 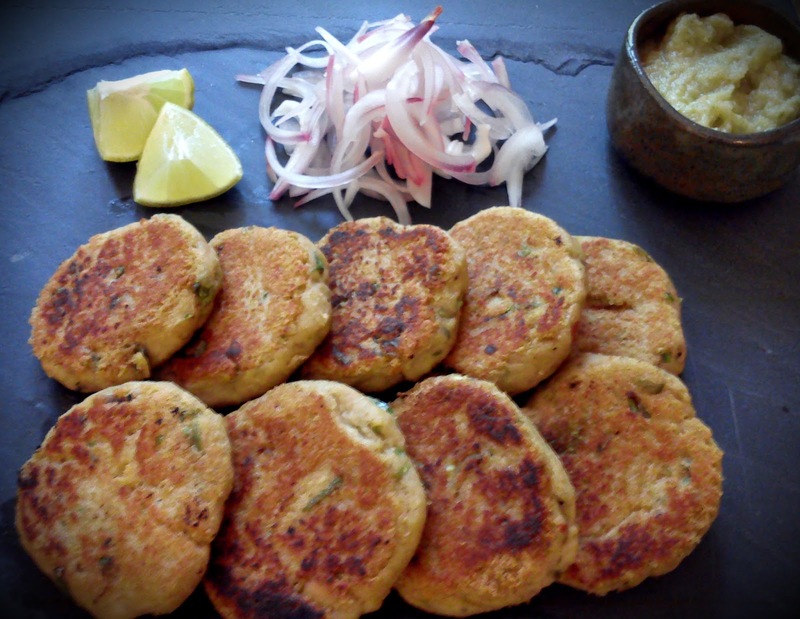 These kebabs are delicate so handle them lightly. 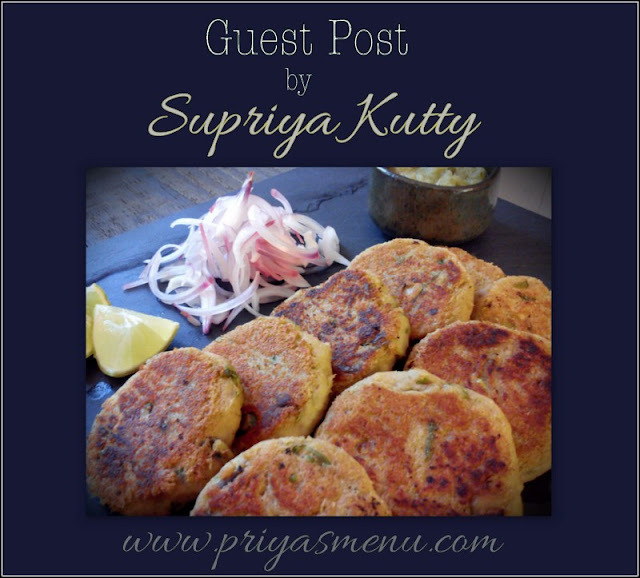 Serve with thinly sliced onions, lemon wedges and mint chutney. Thank you Supriya Kutty for sharing this delicious kebabs to my lovely readers.